Patti Hall, RN, a Nursing Supervisor at Beebe Medical Center, has been honored with the “You make a Difference” Award for August. Patti is one of six nursing supervisors who make sure that twenty four hours a day, seven days a week, patient care operations run smoothly as they are adequately supported by the nursing staff. Nurse supervisors coordinate with charge nurses in the Emergency Department and on the floors to find rooms for the patients, to make sure that units are staffed with nurses, and to solve problems. Patti joined Beebe Medical Center 12 years ago, starting on the Medical-Surgical unit on the third floor. She has been a nursing supervisor for four years. She is known amongst the staff for her strong work ethic and willingness to go above and beyond her role. She will work side-by-side with those in the nursing ranks, always ready to give a hand. She fills in when there are staff shortages and is known to solve whatever issue arises. Staff members trust her judgment, knowing she is committed to the safety and welfare of the patients. All the while, she is energetic and has a positive attitude. 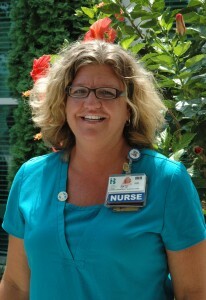 Patti has demonstrated her strong desire to do everything possible to achieve the best results in our patient care. She truly makes a difference each and every day at Beebe. Again, congratulations on receiving the August 2012 “You Make a Difference” Award!